Traffic will be detoured onto local roads, then back onto Interstate 95, for two nights this weekend unless weather forces a delay, officials say. AUGUSTA — Part of Interstate 95 at exit 109 will close overnight this weekend and traffic will be detoured onto local streets before making its way back onto the interstate. Although the schedule could change further because of Thursday’s snowstorm, state officials said plans were to close the northbound lanes on Saturday, starting at 8 p.m., until Sunday at 5 a.m., and the southbound lanes on Sunday, starting at 8 p.m., until Monday at 5 a.m. The closures and detours are needed to allow heavy steel beams to be installed as part of an ongoing overpass replacement project. 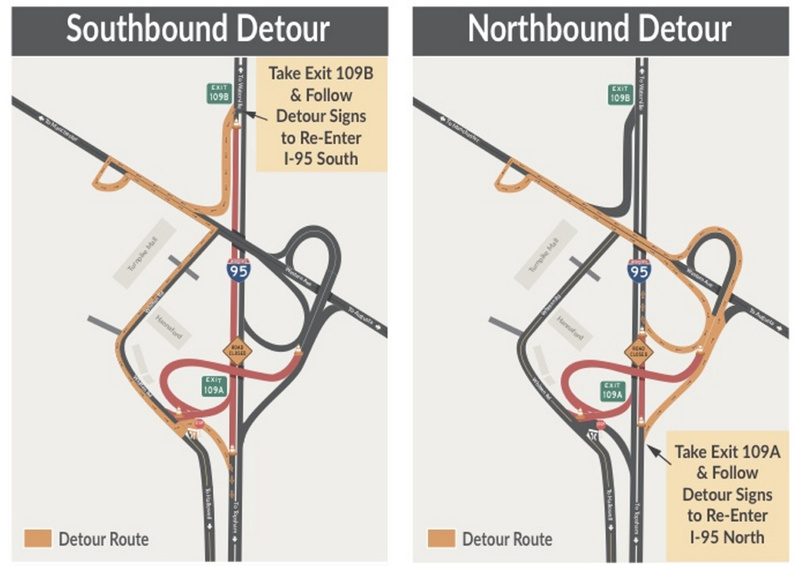 Detour signs will direct traffic off, and back on to, the interstate around the Exit 109 work. Northbound traffic will get off at exit 109A and, following detour signs, travel onto Western Avenue , which is also known as U.S. Route 202, headed toward Winthrop. That traffic will then be directed to turn left off Western Avenue onto Edison Drive to reverse direction and come back onto Western Avenue, headed back toward Augusta briefly, before using the existing northbound on ramp, to the right, to get back onto the Interstate. Southbound traffic will be directed to take exit 109B onto Western Avenue toward Winthrop, then go left onto Edison Drive to reverse direction back onto Western Avenue toward Augusta, then right onto Whitten Road to get to an already established temporary on ramp on Whitten Road and get back onto Interstate 95. Anderson said the beams weigh at least 50,000 pounds each. He said it is standard operating procedure not to lift items that heavy over traffic. The project, expected to take until middle or late February to complete, consists of replacing the overpass’ superstructure, which was damaged last year and serves the exit 109A exit and entrance. The bridge was struck by something large traveling on the interstate sometime in the period of Sept. 1 to Oct. 3 last year, according to Ted Talbot, spokesmen for the state transportation department. Officials are seeking information on who might have damaged the bridge and failed to report the damage. Talbot said the department still hasn’t found out who or what struck the bridge. Anyone with information on that may contact the DOT’s legal department at 624-3020. The overpass replacement project is expected to cost about $3 million. The work originally was scheduled to take place overnight Friday and Saturday, but was postponed because of Thursday’s storm to overnight Saturday and Sunday, Talbot said. There is a chance work could be delayed furtherbecause of weather complications. The overpass, which was built in 1959 and has a clearance of 14 feet, 3 inches, will be replaced with a new one that will be about a foot higher. Anderson said the contractor on the job, Richmond-based Wyman and Simpson, is a few days ahead of schedule. “The contractor has been doing a great job, staying on task and getting things done even though these have not been ideal weather conditions,” Anderson said. The state DOT is posting updates on the project on its website. Anderson said once the superstructure is replaced, the overpass will need to be paved, which is likely to be a challenge, in February, when paving production plants are shut down because it’s generally too cold to pave. Anderson said though doing so is rare, paving can be done in cold weather using special tools and methods to heat the ground, and after making arrangements to have pavement made for the project. He said that pavement probably will be temporary and would be replaced with permanent, more durable pavement when the weather warms in the spring.